Cassia Byler is a twenty-two year old Amish beauty that has the small town of Smicksburg, Pennsylvania baffled. She appears to be content not to court any man, only desiring to work alongside her dad in his herb shop. When pushed too hard to court Moses Weaver by the knitting circle she attends, Cassia reveals the truth; she's been secretly engaged... to an Outsider. Not a baptized Amish member, she won't be shunned, but when she sees her dear dad's broken heart, will she break her engagement? Can she leave the Amish and the herb shop... and her dad? 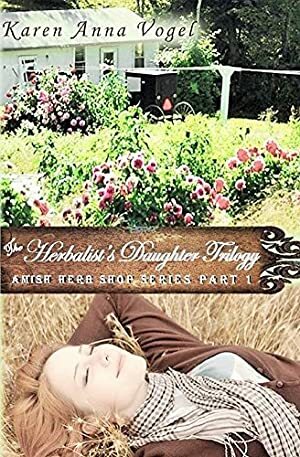 The Herbalist's Daughter takes you on a journey with Cassia Byler as she goes from a selfish, impulsive young woman, to a valley of testing and trials. In the end, Cassia is a joyful Christian woman, having been changed by unconditional love. If you like Stepping Heavenward by Elizabeth Prentiss, Emma by Jane Austen or North and South by Elizabeth Gaskell, you'll be sure to enjoy The Herbalist's Daughter. Discussion guides accompany each book along with Amish recipes. Log In to track Karen Anna Vogel on eReaderIQ. to be notified each time the price drops on any book by Karen Anna Vogel. to stop tracking Karen Anna Vogel. We started tracking this book on October 9, 2014. The price of this book has changed 74 times in the past 1,659 days. The current price of this book is $4.50 last checked 4 hours ago. This lowest price this book has been offered at in the past 90 days is $0.99. The lowest price to date was FREE last reached on January 12, 2019. The highest price to date was $6.99 last reached on October 15, 2016. This book has been $6.99 9 times since we started tracking it. We last verified the price of this book about 4 hours ago. At that time, the price was $4.50. This price is subject to change. The price displayed on the Amazon.com website at the time of purchase is the price you will pay for this book. Please confirm the price before making any purchases.